In 1886 a gentleman named Robert Louis Stevenson set pen to paper and created characters so intense and a subject so fascinating that it is considered one of the most adapted stories to this day. In fact, the very names of his characters are synonymous with good and evil. Stage and film versions have been successful over the years as good vs. evil continues to captivate audiences' imagination. 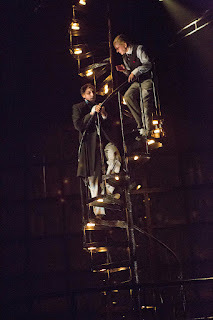 Indiana Repertory Theatre, Indianapolis, opens its 2012-13 season with the intellectual thriller, Dr. Jekyll and Mr. Hyde. 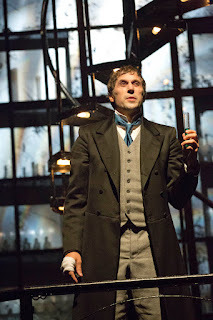 Adapted by Jeffrey Hatcher from Stevenson's novella about split personaties, "The Strange Case of Dr. Jekyll and Mr. Hyde," this stage setting is one of an industrial style. Set in the plush interiors of London attorney Jekyll's home and on the grittiest of London's back alleyways, IRT puts forth an interesting take on the age-old story. As Hyde, Jekyll's alter ego, takes to his evil actions, we are given insight into the mental makeup via four actors representing the internal struggle. What some may have found confusing at first, others were able to understand immediately director Risa Branin and Hatcher's intent that nothing is black and white. One doesn't slip into evil in one fell swoop but by degrees, inching toward it with variables and factors weighing in throughout the fall from good. Ryan Artzberger portrayed Jekyll with great intensity with a parallel performance by Hyde's Kevin Cox. Watching the two personalities battle it out with swift dialogue while the total eclipse was crawling ever closer, made for an intense evening. 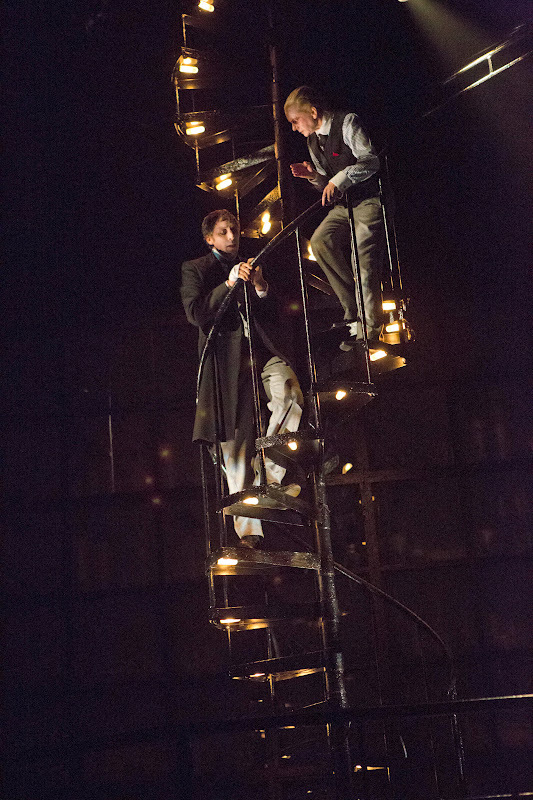 The spiral staircase played a significant role in the play itself ~ symbolizing perhaps the depths of evil and heights of goodness? The lighting, music and choreography all set the tone for a dramatic mental journey giving Stevenson's classic a modern twist. Bottom Line: IRT's Dr. Jekyll and Mr. Hyde sets the standard for all Indianapolis-area theaters this season ~ an absolute must-see. Indianapolis -- In an effort to support Indianapolis Symphony Orchestra patrons during contract negotiations, the Indiana Repertory Theatre will honor symphony patrons that hold tickets to cancelled ISO performances. Patrons can redeem their tickets for any IRT performances through September 23. Shows include Dr. Jekyll & Mr. Hyde, The Syringa Tree and The Night Watcher. ISO patrons can call the IRT Box Office at 317-635-5252. Visit IRTLive.com or call the IRT Box Office at 317.635.5252. Elizabeth J. Musgrave is a syndicated fine-living, travel columnist, freelance writer, and performing arts and restaurant critic for Gotta Go. Read her new column, Infused, at GottaGo.us and FoodandDrinkDigital.com and catch her as Indy’s Entertainment Adviser on 93 WIBC. Gotta Go is published on Gottago.us, BroadwayWorld.com, in magazines and Indianapolis area newspapers. Follow her on Twitter @GottaGo, LinkedIn and Facebook. A few suggestions for the several hundred travel writers in Indianapolis for SATW 2012. Traditions, unique shops and more wait for your discovery and delight. Below is a list of 10 you don't want to miss. Welcome to Indianapolis! 1) The Canal-With arguably the city's most peaceful scenery, paddle boats and walkways, this three-mile popular spot at White River State Park is the perfect place to go for exercise, photo ops and relaxation. 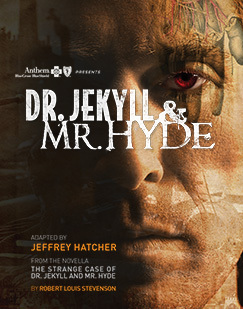 2) Indiana Repertory Theatre-(400 W. Washington St.) Within steps of many hotels downtown, IRT as locals call it, is currently offering its 2012-13 season opening show Dr. Jekyl and Mr. Hyde which has opened to rave reviews. 3) Teapots n' Treasures-(7 E. Market St.) The very definition of eclectic, this tiny shoppe is still a secret from most and is filled to the rim with fresh teas, a diverse collection of teapots and more. 4) St. Elmo Steakhouse-(127 S. Illinois St.) The world famous shrimp cocktail draws the rich and powerful, celebrities and locals alike to prove they can handle the heat. 5) War Memorials-As the city with the most war memorials outside of Washington D.C., Indy's memorials can be found throughout the downtown area, including along the canal and on The Circle, many within walking distance. 6) The Elbow Room-(605 N. Pennsylvania St.) Hit this place up between 4-7 p.m. for their $5 and under menu, including pulled pork nachos, antipasto/hummus plate and trio dip tray containing Bo-Bo's spicy crab dip. 7) Eiteljorg Museum-(500) W. Washington St.) Quest for the West exhibit (through Oct. 7) features 50 of the nation's top Western artists. Go in time to lunch outdoors overlooking the canal. 8) The Canterbury-(123 S. Illinois St.) Serving authentic high afternoon tea is just one more way the historic hotel sets itself apart. 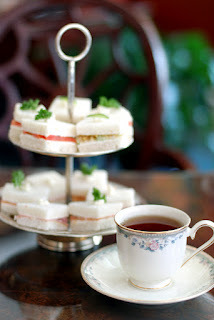 Lush interior and attentive waitstaff make the scones and tea even more luxurious. 9) Mass Ave-For boutique shopping, including Silver in the City, Mass Ave Wine Shoppe and Mass Ave Toys tucked in between a variety of eateries. 10) Shapiro's Delicatessen-(808 S. Meridian St.) Another world-famous eatery, this one creates sandwiches, including the locals' must-try Reuben sandwich since 1905. 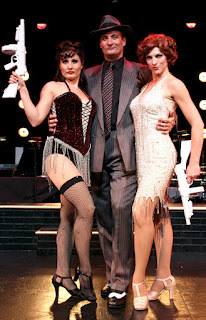 Chicago the musical, one of theater's favorites, returns to the stage in Indianapolis at Beef and Boards Dinner Theatre. 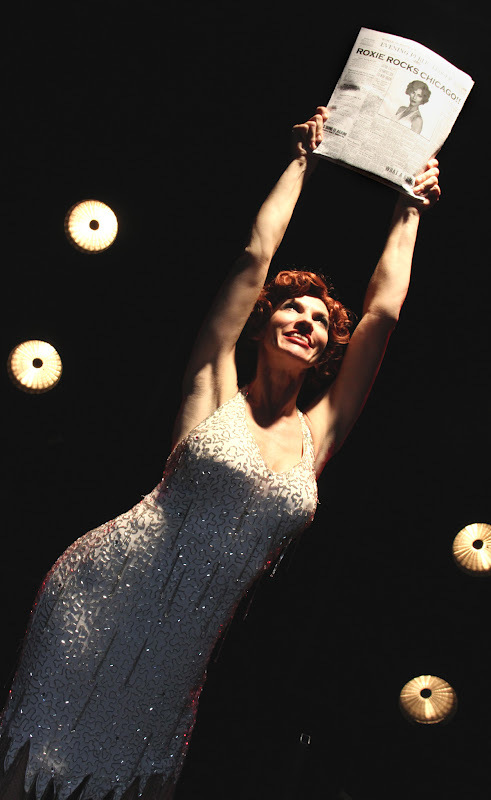 Deb Wims portrays Roxie Hart, the dreamer willing to do anything (including murder) to reach star status. Wims' energy and sassy attitude push her normally lovely dance and vocal talents to an even higher level. Breaking away from the usual good-girl roles, Wims' vampish-yet-naive approach to Roxie clawing her way to the top is pure gold as shown in "Roxie." From the moment Curt Dale Clark glides into view, he takes center stage as that charming, albeit conniving, attorney Billy Flynn. There is something deliciously sly and altogether captivating about Clark's version of the superficial and silky smooth lawyer who wins all of his court cases with a smile, bribes and his powers of persuasion with the media. And of course, a little.. make that a lot... of "Razzle Dazzle," one of Clark's best numbers of the night as a duet with Wims. Showing off his skills of puppetry persuasion with the press, court of law members and clients, Clark, Wims and company bring down the house with "We Both Reached for the Gun." 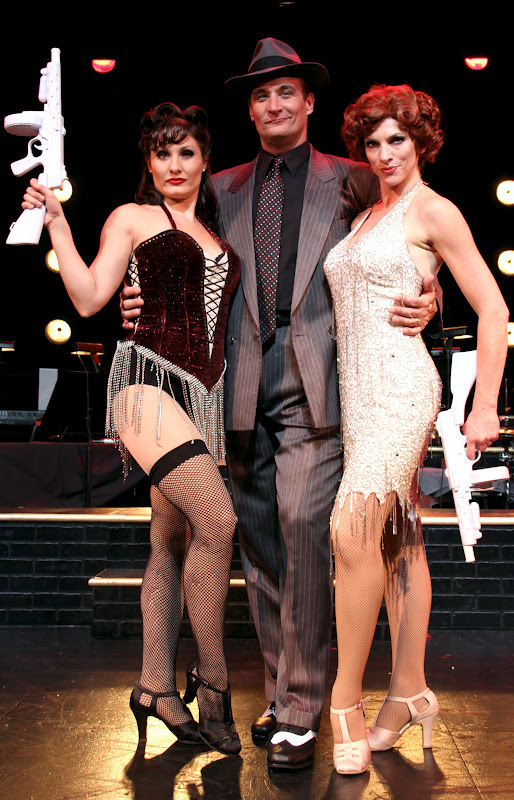 Marisa Rivera brings a slightly softer side to the role of double-murderer Velma Kelly showcasing her vocals and dance skills best in "All That Jazz" and end-of show duet with Wims, "Nowadays." Alene Robertson as Matron "Mama" Morton draws laughs while Eddie Curry draws empathy from the audience as sap-husband Amos Hart. Sally Scharbrough, as Liz, lights the stage, sizzling in Chicago once again. Last seen in Actor's Theatre of Indiana's version last season, (review here) Scharbrough stands out again in B&B's production. You either grow weary of Chicago seemingly every season on some stage in the city or you rush to see the latest take on the Bob Fosse-classic satire of the seedy side of the jazz and post-prohibition era in the Windy City. Either way, this Marc Robin directed ~ Buddy Reeder choreographed combo is one you will add to that glad-I-saw list. 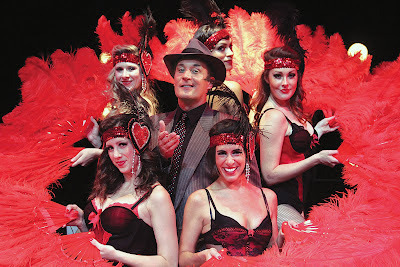 Bottom Line: I will keep this succinct: "Chicago...the Musical" is, by far, one of my all-time favorite Beef and Boards' productions in the six + seasons I have reviewed. 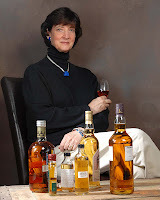 I was invited to review "The Smart Guide to Single Malt Scotch Whisky" by Elizabeth Riley Bell. I couldn't wait to delve into the intricacies of the libation of Scotland, particularly through the guided hands of the noted leading female voice in the predominantly male field of expertise. When learning about a new topic/interest, I like to start with words..no great shock I'm sure...and entering the Scotch world to learn, taste (and spit) I find the confusion starts at the very beginning...the name. Is it Scotch Whiskey or Scotch Whisky? That's exactly how basic things are for me in the world of whiskey, er...I mean whisky...or do I? The easiest way to figure out if there is a difference in the actual spirit or whether some folks just don't know how to spell is to ask an expert. Or not. After researching numerous sources, it all seems to come down to this for me. Whiskey with an 'e' is most traditionally used for American and Irish whiskey(s), while Canadian, Scotch and Japanese whisky(ies) leave the extra vowel out of its spelling. With that said...both spellings have been found on bottles in all countries throughout history and most countries are narrowing down which is preferred. The controversy makes for great conversation while enjoying the liquor, however, which is part of the fun of this drink. Riley doesn't get that elementary in her manual, it is assumed readers know the difference between the spellings and there are various types of whiskies, and have chosen to enrich their education about Scotch's single malts and blends for the single most important factor: taste. Throughout the guide, Bell has three sidebars ~ Whisky Lexicon, The Noser Knows and The Distillery Cat's Meow ~ giving helpful terminology, tasting notes and historical facts enhancing the guide immensely. Starting with the labels, storing malts and cost vs. value in section one, Bell gives great insight to the differences and similarities of the distilleries' names, locations and tastes. Moving into the chapter on tasting, the reader receives step-by-step instruction on the best process to get the most out of the experience. 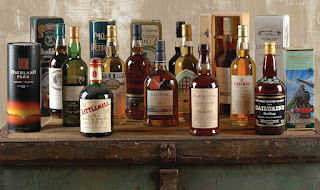 In section two, the authority then gives detailed tutelage of the whisky-making process, including water choice, barley standards, distilling techniques and maturation and cask choice. Bell gives intimate insight, tips and history of each with a respectful, yet conversational tone. In a phone interview, Bell discussed with me the ease of obtaining Scotch nowadays from boutique distilleries ("much easier with internet"), being a female in the early days of the male-dominated world of Scotch ("not difficult at all"), and how do American mixologists rate in knowledge of Scotch? "As with anything, it varies from place to place," explains Bell. "There are growing opportunities in bars that offer a wide selection of choices, and, often times, there is a mixologist on site who is knowledgeable about them. Also there have been some very exciting things done ~ particularly in the larger cities you see this more often ~ of experimentation done with Scotch cocktails. "I think American mixologists can hold their own with Scotch. It is certainly a growing field I find that mixologists today know a great deal more about single malt than they did 20 years ago and we all benefit from that. It's one of the best times as far as availability, quality and opportunity we've seen in the exploration of Scotch whisky." The author admits she is clearing out and making way for new bottles in her stash by auctioning her own personal collection of decades worth of Scotch in October. The sale will take place at Bonhams 1793 NYC. 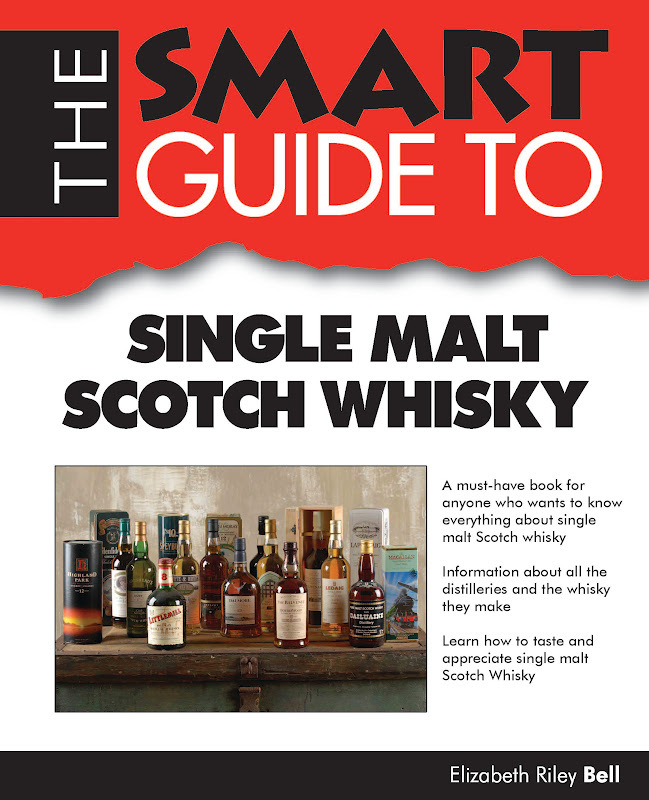 Bottom line: Elizabeth Riley Bell's straight-forward approach, coupled with fun graphics, detailed maps, step-by-step instructions and history make The Smart Guide to Single Malt Scotch Whisky an absolute must for the scotch drinker, maker and collector of all levels. Review copy and images provided by publisher and Elizabeth Riley Bell. Take a dollop of "Grease," mix in some "Pump Boys and Dinettes" and add a generous dose of "Forever Plaid" for the high-octane fun of "Route 66." From the sounds of 1950s Chicago and traveling along the “Main Street of America” to the California coast with the surf music of the '60s, this musical revue features “Rock ‘n’ Road” hits including, “Dead Man's Curve,” “King of the Road,” “Little Old Lady from Pasadena,” “Little GTO,” “Fun, Fun, Fun” and many more. The Musical of Musicals...The Musical! With book, music and lyrics by Eric Rockwell and Joanne Bogart. Sometimes one musical is not enough! In this comic Off-Broadway satire of musical theatre genres, the same story, “You Must Pay The Rent”, is told five different ways - each in the distinctive style of a different master of the form...Rodgers and Hammerstein (Oklahoma, South Pacific), Stephen Sondheim (Company, Sweeney Todd), Jerry Herman (Hello Dolly, Mame), Andrew Lloyd Webber (Phantom of the Opera, Evita), & Kander and Ebb (Chicago, Cabaret). Based on Bernard Shaw's play "Pygmalion," with book, music and lyrics by Lerner and Loewe, "My Fair Lady" is triumphant. With "Wouldn't It Be Loverly?" "I Could Have Danced All Night," "On The Street Where You Live" and "Get Me To The Church On Time" it's no wonder everyone - not just Henry Higgins - falls in love with Eliza Doolittle. Includes a 10-person cast and dueling pianos for this unique version of a classic. Tickets, directions and schedule are available at ActorsTheatreofIndiana.org.